Welcome to Patch 3.26! We are excited to announce Zariel, the Celestial. Zariel is a warrior deity of Holy Justice who abides in blessed Elysium. He uses Gauntlets and Bow to take down both Demon hordes and any warrior participating in the Grand Tournament. Aside from Zariel, we also have made an adjustments to Meet the Legends, the user interface, Power Rankings, and controller customization. We also have done balance changes and bug fixes this patch. Wild Chest is also available this patch for a limited time and contains three exclusive skins! Brawl of the Week – KO Mania! Controller button icons are now universal in look across all screens, and the icons have been reworked to be less distracting for situations when being presented with lots of information at once. Controller players with custom binds will now see the correct icon prompt for picking up items. UI prompts for keyboard players with custom keybinds will now show the updated key. Players using PS4 controllers will now see PS4 button icons instead of Xbox 360 icons. In cases where both controllers are being used at the same time, the correct buttons will show for each player. Players using controllers that lack some of the rebindable buttons from the Xbox 360 controller (e.g., GameCube controllers only have one left shoulder button) will no longer see buttons they can’t rebind listed on the controller bindings screen. Players using Playstation Vita Remote Play will now see special Vita icons for all buttons. Keyboard players will now see keyboard icons for all buttons. Wild Chest has appeared containing 3 exclusive skins! Fixed a bug where resetting your controller to the default controls would successfully reset your controls, but the displayed bindings wouldn’t update. The displayed bindings will now correctly reflect the defaults before exiting the bindings screen. The tutorial preview animation ‘Next’ button now always visible and starts off inactive instead of just appearing once the animation has completed. Updated Power Rankings for Summer. Increased list limit from 100 entries to 250. The selected tab under the “Meet the Legends” menu option has been adjusted to be more visually obvious. With Dreamhack Valencia and the Summer Championships in the books, we resume regular balance patches this week. There are a number of general weapon changes following high level discussion surrounding these competitive events that are aimed at closing the gap between one of the more overtuned weapons and the rest of the field, while improving many of the underperforming weapons in either reward of ease of use. Several of the most overperforming Legends have also been brought in line with their peers, as their kits had grown in strength from general gameplay changes over time and adjustments to their counterpicks. Legends that have fallen behind due to these same reasons have received improvements to better suit the current pace of gameplay. The Lance’s aerial kit is one of the harder to master options available in Brawlhalla, with its attack movement and overall coverage requiring a higher degree of precision and spacing against equally skilled opponents. We have increased not only the pacing on several of these attacks, but also the total coverage and distance to be comparable to that which can be achieved by other weapons with greater freedom of movement, such as rising or falling Side Air attacks. This will enable Lance players to play more confidently when approaching and make better use of the Lance’s excellent priority. Lance Neutral Air: Decreased Time to Hit from 14 to 13; Decreased Cooldown on hit from 9 to 6; Changed Force from a range of 50~58 Fixed/28~32 Variable to a range of 68~51 Fixed/0 Variable; Changed Stun from 28 to a range of 34~28; Slightly increased threat coverage near the user and the engine. Lance Down Air: Increased travel speed; Increased Hit Window from 10 to 12. Lance Side Air: Increased travel speed; Increased Hit Window from 8 to 10; Increased Force from 65 Fixed/39 Variable to 65 Fixed/42 Variable. While the Blasters range and pace of attack is performing well, the rewards for landing successful attacks sets their rate of damage below expectations. This has caused Blasters users to rely too heavily Heavy attacks to score knockouts, resulting in longer matches. We have increased the reward on a number of the Light attacks to bring this rate of damage into a healthier range for more enjoyable match lengths and more diverse play when looking to secure knockouts. Blasters Side Air: Increased Damage from 16 to 17; Increased Force from 49 Fixed/37 Variable to 49 Fixed/40 Variable. Blasters Side Light: Increased Damage from 15 to 16. Blasters Down Light: Decreased Time to Hit from 10 to 8; Increased Damage from 15 to 16. Tournaments and competitive events have shown the strength of the Katars and have proven them to have a reliably higher potential reward on hit than the other available weapons. We have reined in the total coverage and safety of its most popular approach option, the Down Air, as well as opened more avenues for contesting Katars users once their momentum and reward has begun. The most commonly used attacks of Neutral Light and Neutral Air, have had their priority and coverage trimmed to be in line with other similar options and allow increased areas for counterplay and defense against Katars users. Katar Neutral Light: Increased Time to Hit from 6 to 7; Slightly decreased horizontal threat coverage towards the front and rear; updated hitboxing to better match the animation; increased Recover time on miss from 1 Fixed/12 Variable to 3 Fixed/12 Variable. Katar Neutral Air: Stun changed from 25 to a range of 25~18; Slightly decreased threat coverage at maximum range; updated hitboxing to better match the animation. Katar Down Air: Decreased Hit Window from 19 to 16; Decreased Stun of final hit of the aerial version from 14 to 12, and the grounded version from 10 to 11; Slightly decreased threat coverage; Increased Force on the grounded version from 21 Fixed/4 Variable to 21 Fixed/10 Variable; Increased Recover time on miss for the aerial version from 0 Fixed/15 Variable to 3 Fixed/15 Variable, and the grounded version from 2 Fixed/14 Variable to 7 Fixed/10 Variable. The Spear, while a versatile weapon with utility and range, scored knockouts later than similar options on other kits with better speed and priority. We have slightly increased the speed and force on some of the Spear’s key finishing attacks to help it better compete with a more reasonable knockout time. Spear Side Air: Increased Force from 45 Fixed/40 Variable to 45 Fixed/42 Variable. Spear Recovery: Decreased Time to Hit from 16 to 15. Spear Ground Pound: Decreased Time to Hit from 17 to 16; Increased Force from 53 Fixed/42 Variable to 53 Fixed/44 Variable. We have increased the Cannon’s reward for scoring hits in the form of greater stun and advantage, allowing it to continue pressure and grant a heavier reaction to its strikes. The Neutral Light has received a decrease in Recover time on miss, as it is one of the few attacks that does not propel the user on use and has a crucial role in challenging an opponent’s gameplan. Cannon Neutral Light: Increased Stun from 26 to 27; Decreased Recover time on miss from 1 Fixed/12 Variable to 1 Fixed/9 Variable. Cannon Side Light: Increased Stun from a range of 27~22 to a range of 30~25. Cannon Side Air: Increased Stun time from 13 to 14. The Signature changes this week are focused on bringing the most outlying Legends closer to their peers. A number of widespread improvements to Orion are aimed at enhancing his utility and reward, as his Signatures have slowly fallen behind the curve. Conversely, other Legends such as Hattori and Asuri have benefited from general weapon and mechanics changes more than others over time, showing a greater strength at high level play. These changes bring their kits toward a level of utility and reward closer in line with more recently released Legends. Orion Neutral Lance: Decreased Recover time from 24 to 16. Orion Side Lance: Increased travel acceleration near the beginning of flight; Decreased Recover time from 20 to 16; Increased Force from 70 Fixed/51 Variable to 70 Fixed/53 Variable. Orion Neutral Spear: Increased threat coverage near the user and the top of the arc. Orion Side Spear: Increased travel speed; Decreased Recover time from 20 to 14. Orion Down Spear: Decreased Recover time from 20 to 18. Hattori Neutral Sword: Decreased threat coverage toward the rear of the power; Decreased Force from 58 Fixed/57 Variable to 58 Fixed/52 Variable. Hattori Side Sword: Increased Minimum Charge time from 11 to 13; Decreased Damage from 27 to 23; Decreased Force from 65 Fixed/56 Variable to 65 Fixed/52 Variable. Asuri Neutral Sword: Decreased threat coverage towards the top of the swipe. Asuri Side Sword: Decreased Recover time from 31 to 29. Asuri Down Katar: Decreased threat coverage toward the top and rear of the power; Decreased Damage from 29 to 23. Asuri Side Katar: Decreased threat coverage toward the top and rear of the power. Isaiah Neutral Blasters: Decreased Minimum Charge time from 11 to 10. (Steam only) fixed a bug where remapping an input that was set to “Show Names” or “Pause” would result in that button performing both the new input and the old input. Fix for crashes joining games. Fix for crashes in room browser. Updated Pressure Mine explosion fx animation for improved performance. Lance Down Light: Fixed a bug that prevented players from being able to change their trajectory when struck by repeated instances of this power as part of a combo. Fixed a small flicker that would happen on certain character’s shins when doing a taunt. Fixed a bug on PS4 where beginning frame-stepping during a spear ground pound would cause the helicopter sound effect to loop endlessly until frame-stepping was exited. 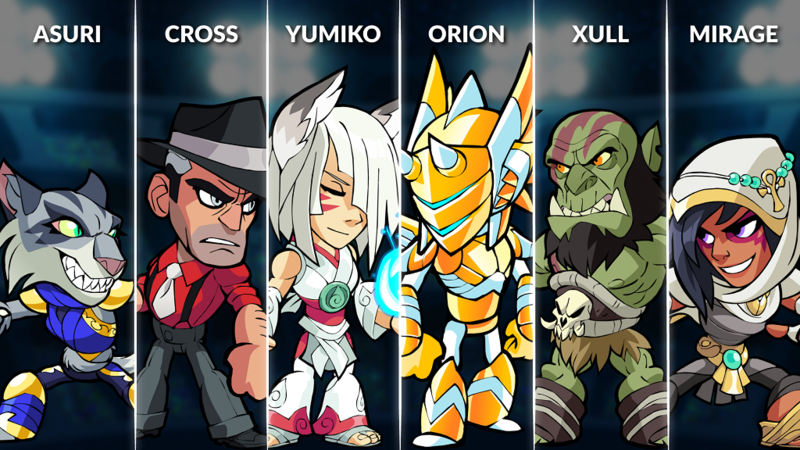 This week’s Legend rotation includes: Asuri, Cross, Yumiko, Mirage, Xull, and Orion. Cross – For years he had owned New York City, but can he do the same in Valhalla? This charismatic mobster steps into Valhalla with Blasters and Gauntlets. Yumiko – Holding the appearance of a blind seamstress this centuries old fox spirit has been brought into battle wielding her Magical Hammer and Bow! Mirage – An occultist, martial artist and spy, this agent uses the powers of magic and time-travel along with her Scythe and Spear to take down her foes. Xull – An Axe and Cannon wielding Orc Warlord. With Legendary physical strength he is ready to challenge everyone and everything in Valhalla! Orion – Never speaking of his past this mysterious warrior wields Spear and rocket Lance.